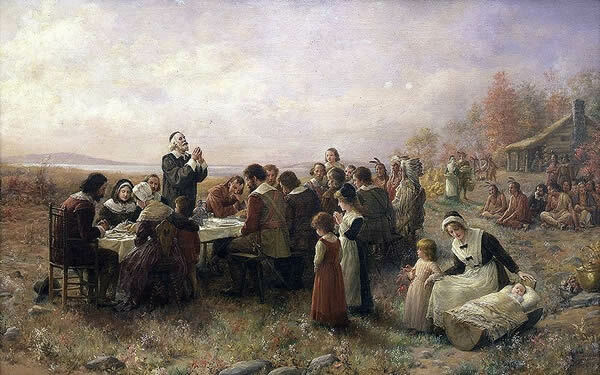 The events leading up to this started in September 1620, when a ship called the Mayflower left Plymouth, England, carrying 102 passengers—an assortment of religious separatists seeking a new home where they could freely practice their faith and other individuals lured by the promise of prosperity and land ownership in the New World. After a treacherous and uncomfortable crossing that lasted 66 days, they dropped anchor near the tip of Cape Cod, far north of their intended destination at the mouth of the Hudson River. One month later, the Mayflower crossed Massachusetts Bay, where the Pilgrims, as they are now commonly known, began the work of establishing a village at Plymouth. In 1863, at the height of the Civil War, in a proclamation entreating all Americans to ask God to “commend to his tender care all those who have become widows, orphans, mourners or sufferers in the lamentable civil strife” and to “heal the wounds of the nation.” President Abraham Lincoln scheduled Thanksgiving for the final Thursday in November. It was celebrated on that day every year until 1939, when Franklin D. Roosevelt moved the holiday up a week in an attempt to spur retail sales during the Great Depression. Roosevelt’s plan, known derisively as Franksgiving, was met with passionate opposition, and in 1941 the president reluctantly signed a bill making Thanksgiving the fourth Thursday in November. Today’s Thanksgiving celebration has lost much of its original religious significance; instead, it now centres on cooking and sharing a bountiful meal with family and friends. Turkey, a Thanksgiving staple so ubiquitous it has become all but synonymous with the holiday, may or may not have been on offer when the Pilgrims hosted the inaugural feast in 1621. Today, however, nearly 90 % of Americans eat the bird—whether roasted, baked or deep-fried—on Thanksgiving, according to the National Turkey Federation. Other traditional foods include stuffing, mashed potatoes, cranberry sauce and pumpkin pie.